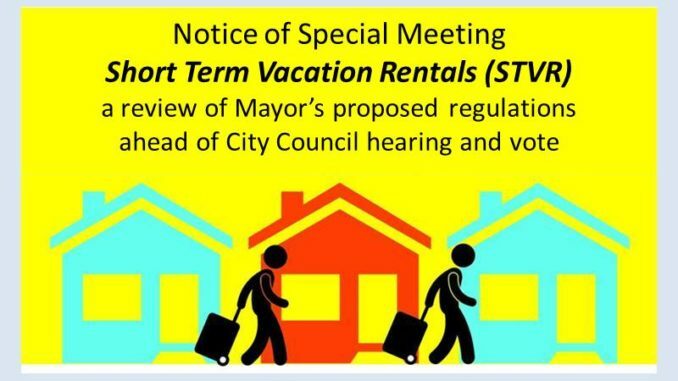 ICYMI: City Council is holding a hearing (and potential vote) on Monday, July 16 on the Mayor’s proposed short term vacation rental regulations. The San Diego Community Short Term Vacation Rentals (STVR) Working Group will review the Mayor’s proposed STVR regulations on Thursday, July 12, at 5:30 PM, at a special meeting at the La Jolla Recreation Center, 615 Prospect Street. The public is invited to attend this special public meeting hosted by La Jolla Town Council to learn more about the Mayor’s proposal. City Council is holding a hearing (and potential vote) on Monday, July 16 on the Mayor’s proposed short term vacation rental regulations.